I used a combo of SU inks and a sketch from SCS. I thought they stamped fin, but used the Misti and stamped more than once to get great coverage. I will send this to my piano teacher- I only have 4 lessons in the summertime...... The black die is from Sweet Stamps. I did not get good news from my Physical Therapist- my back has some bad issues and I am going to have to really revise my activities (eg, I have a desk job-will need to stand up more.....). I joined a 'One Card a Month' or OCAM swap with the Michael Strong Yahoo Group. I used Michael Strong Nesting Squares. I added distress inks onto the cardstock, then stamped the image. I colored/stamped again, and cut out the center layer. I added the flower with a dimensional in the center of the . small square- and had to add some Stickles. I added white Pen to some of the circles in the image. I figured this would be a fabulous way to ink up my unused stamps. 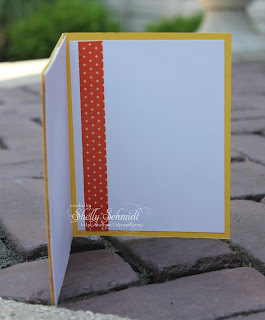 This is the first time I have used the Nesting Squares stamp. I have been MIA again- my back went out last week- I am back up and about and will survive. 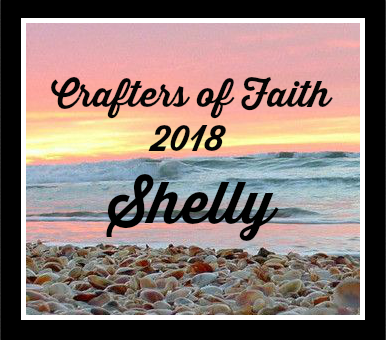 I will be around to blogs once I can!!! It is time for the June Dazzlers post, and our hostess for this month is Darlene. 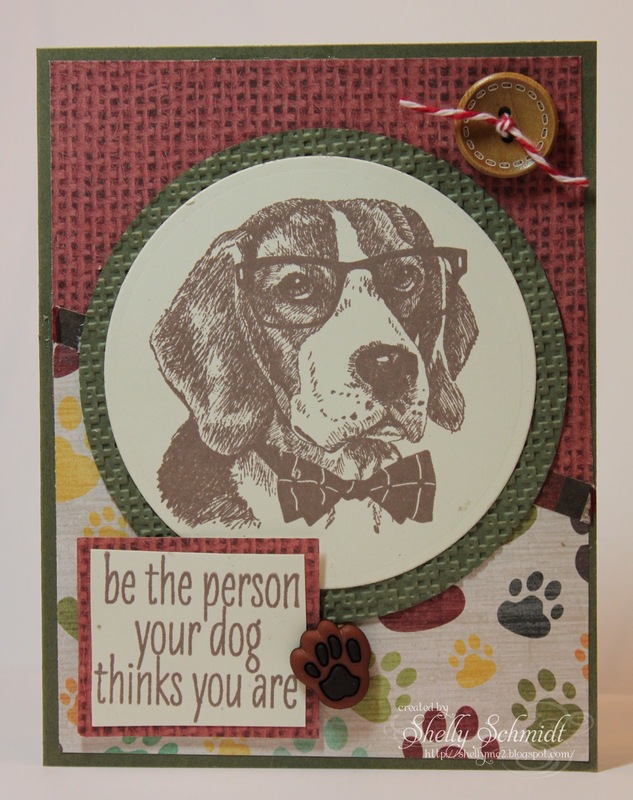 I loved this kit and had a blast creating this card! Sentiment: Hero Arts "Be the Person"
Plastic dog paws are Paper Studio's Spare Parts, "Knick Knacks"
Buttons from Hobby Lobby, sewing section. I used the SCS Sketch 597 for the layout for this card. My husband does most of the pet care here. Our dog is getting old and grumpy, and likes him better : ) He is a really good dog- but almost 15. My childhood pet was a black poodle named ZsaZsu. There were 7 of us kids and she got lots of attention. I do not remember putting her on a leash and walking her like we do with our dog, but we had a huge yard and lots of activity. School's Out for Summer- yippee! I made a card for my daughter- she taught in China for 3 years, came home last summer and has taught 9th grade in Chicago this past year. 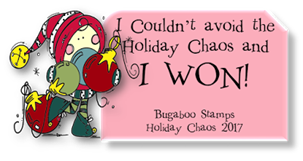 This cute image and sentiment are from Bugaboo. This just tickles me- cause I know the teachers are so feeling this! The kids really do not want to be in school the last days before break. The cardstock and washi are from SU. The stitched circle is Memory Box. The sequins recollections and from a share on a Facebook group. 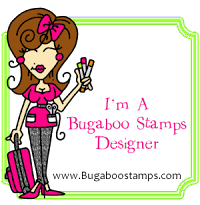 Over at the Outlawz Paper A la Mode, they are sponsored by Bugaboo and are asking for shaker cards, and so glad I found this challenge. At 613 Ave Create- we need to use one item from each category and create a challenge-I used: sequins, a shaker and Thinking of you. A HUGE Thanks to all of the teachers out there! I have had a friend on my mind and in my prayers alot lately, and thought I'd color up a card for her. She is quite a gardener, so I chose a Daffodil to create with. The image is colored with Copics. 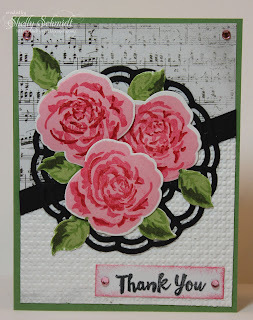 The flower and sentiment are from Create with TLC. The DP is Paper Studio's Country Road stack. Congrats to all of the kids (and adults) who graduated this year! Wahoo!!! I used a Sketch for the Michael Strong Yahoo Group to create this card. I used an older grad image from SU in Real Red, Gray. The Black is Tuxedo Black Memento ink. The star (Michael Strong) was stamped in Versamark and embossed in Queens Gold EP. The red strip has a star from the grad set stamped in Versamark. The GRAD letters (Michael Strong) were stamped in Tuxedo black as well. I used twine and gold cord in the tag end. Crafting When we Can -add stars. ABC Challenge- I is for Important (event-Graduation). I used Ranger distress inks on the background- 2 greens and one yellow. The image was stamped in brown, and I used Ranger distress ink Antique Paper to add a little shading and stamp a little Kanji on the base of the image. The MS punched edge from white CS was sponged over in Green. 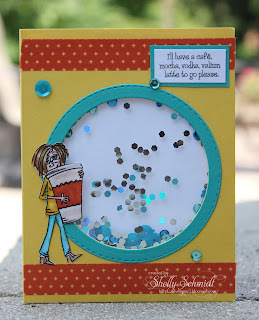 The challenge at Paper Ala Mode is ATC's. Craft Rocket wants to see Monochromatic projects. Through the Purple Haze wants to see a punch. I did not know what I was going to get with the EP. I know it looks better on dark colored cardstock, so I just used black for starters. I will play around with it more, but I think it may change colors more if you apply more heat to it. I decided to use an image from Michael Strong Stamps- nice and springy : ) I cut apart the image into individual segments, and used the shape as a starter for my background. I popped up the bee on dimensionals. I used a hexagon stencil and added distress inks to the background- I added a little purple to the background too as well to tie in the purple from the embossing powder.